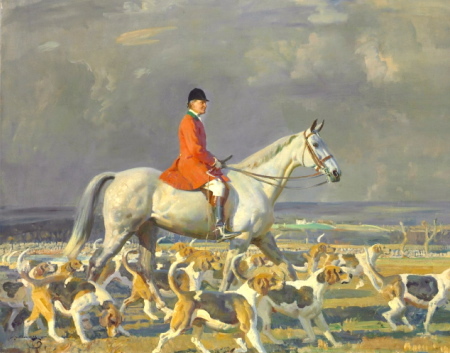 Fox-hunting – the great pastime of the English countryman, conjures up vivid images. 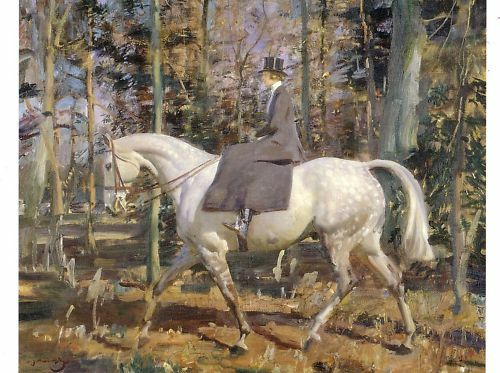 But women riders – sitting beautifully upright on their great glossy horses, flowing habits cascading, top hats fixed firmly over neatly coiled and netted hair, veils secured across haughty faces, all galloping along at great speed and daringly taking all obstacles have all my admiration. The Dianas of the hunting field. What courage! What style! How on earth did they stay on their horses? Jules Pellier invented a saddle with two pommels to hold the rider more securely in place so she could gallop and jump in the hunting field. Here is a perfect illustration to demonstrate exactly how perching on her horse like the fearless huntress she was, with no apparent effort or aids to stay on the horses back was achieved. Underneath the flowing skirt of her navy worsted habit was the strangest saddle imaginable. It looked lop-sided and bulky because it was. It involved two pommels a fixed head and a leaping head. 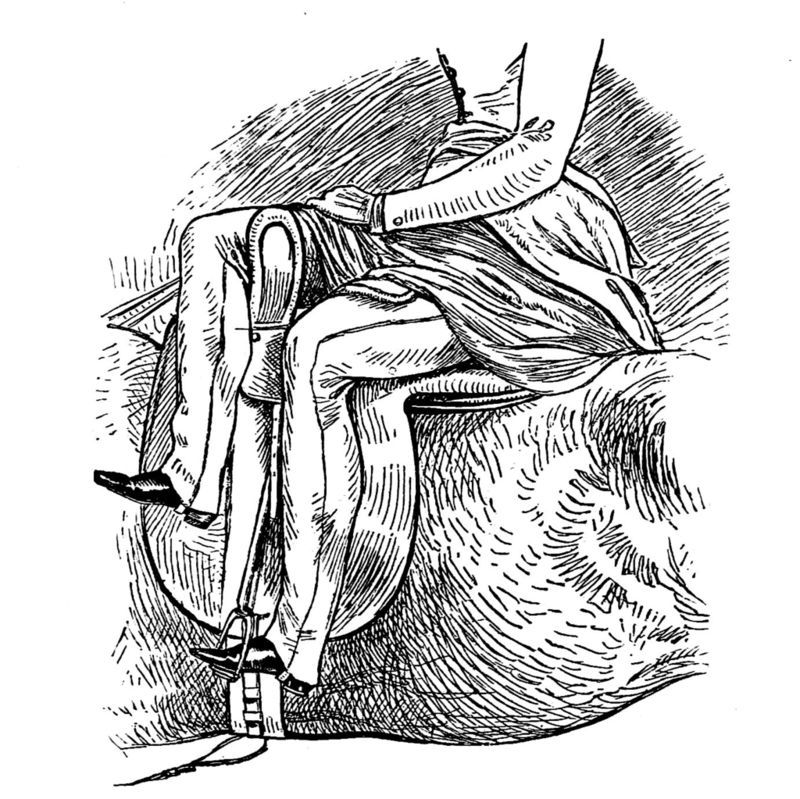 One supported the right thigh, and the second one held her left thigh secure between pommel and stirrup.When she was ready to gallop across the field and take a five barred gate she pressed her left thigh up against the leaping pommel and her right thigh downward and there was no toppling! The long right side of the skirt could be lifted up and buttoned behind in the small of the back. 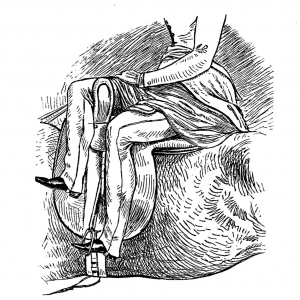 But when the rider was seated aside on her horse, the skirt fell evenly to cover her legs completely. 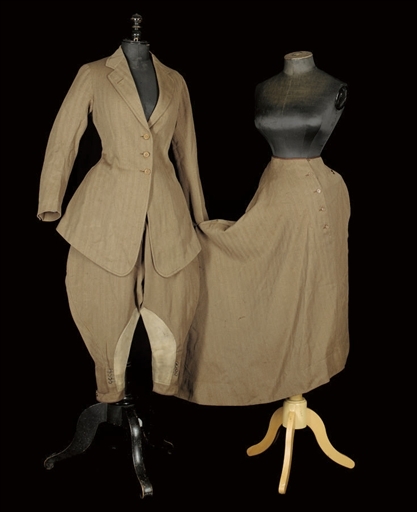 The riding habit worn in the early 1900s had what was called a pocket for the right leg, which sat higher on the horse and would have lifted the hem up so you could see part of the rider’s leg. So the right hand side of the skirt was diagonally longer and when the rider was seated aside on her horse the skirt fell equally to the edge of her boots, completely concealing her legs. 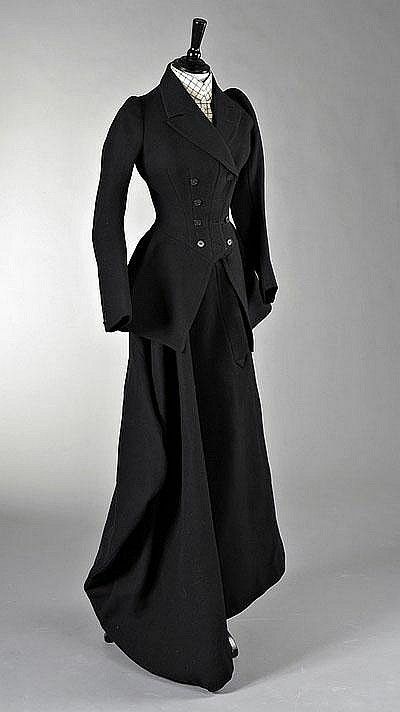 When she was walking around this elongated right side of her skirt was lifted and buttoned up in the small of her back giving her habit a lovely line. In the 1900s women started to ride astride, giving them greater freedom and more contacts with their mount. They wore riding jodphurs, and over these were wrapped an apron skirt modestly covering her parted thighs! Hugely frowned on and forbidden by some hunts women nevertheless prevailed and by the 1920s it was quite acceptable for women to wear jodhpurs and ride like men. Queen Mary most strongly objected to women riding astride, in 1913 she made a royal decree forbidding women to ride astride along Rotten Row in Hyde Park.